With that 40 week marker only weeks away, we’ve been working hard to try and establish a more solid bedtime routine for Theon, partly in the hope that it will help with the arrival of Boo number two, but mostly so the kid can catch up on some Z’s before his sister shows up and turns his world on it’s head! The biggest part of which has been trying to stick to a daily routine of activities including a walk (especially now the weather permits) before bed time to burn off any last bursts of energy and get him all (in his words) ‘shnoozie’. 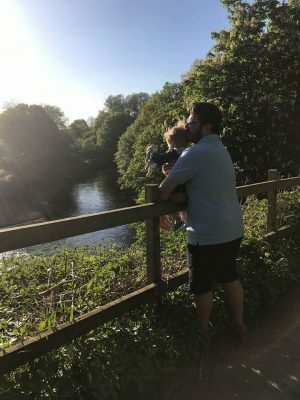 We’re pretty lucky where we are to have a good number of country parks surrounding us and being new(ish) to the area we are constantly discovering new Parks and Country Walks. 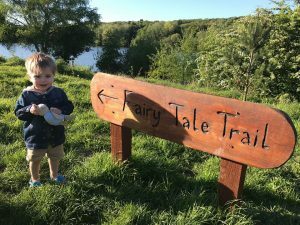 Our latest discovery being Clifton Park and it’s Fairytale Trail. 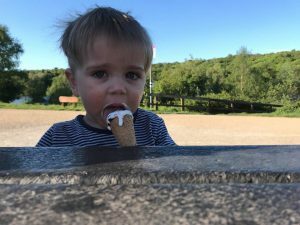 I’m not gonna lie, the pre-walk ice-cream was more a pregnant mummy motivator to power me through and possibly added to the job at hand, but the walk was long enough to burn the calories and the scenery was picturesque enough for me to not care about all the extra exercise. Looping around the River Irwell, the walk weaves in and out of the local woodland with hidden wooden sculptures of everyones most favourite fairytale characters to discover as you make your way around. 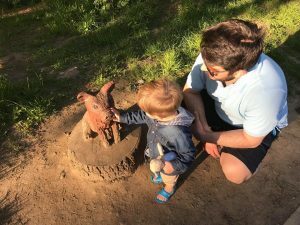 The park is full of wildlife and has lots of other interactive coves to explore including a play area and community garden projects. We managed to thoroughly wear little legs out and despite being a little bit pooped myself it was well worth it, not only for the scenic stroll, but the full, uninterrupted nights sleep we got, with Theon sleeping all the way through until 8.30am. If that’s not a happy ending I don’t know what is! All was quiet in the deep dark wood. The boy found a Gruffalo and he was made from wood.